Coming off an overtime win against Hartford on Tuesday, Quinnipiac (5-3 overall, 2-0 MAAC) continued to carry momentum as it defeated St. Bonaventure (0-7 overall, 0-4 MAAC) 12-7 on Saturday in Hamden. The Bobcats extended their winning streak to five games after starting the season 0-3. Despite St. Bonaventure’s record, senior attack Mike Fletcher said he made sure that his teammates weren’t going to take the Bonnies lightly. The Bobcats had a tough task in front of them as they went up against St. Bonaventure’s freshman goaltender Brett Dobson, who’s second in the MAAC in saves per game with 14.25. However, the Bobcats were unphased as they scored four goals in the first quarter. Another factor in the Bobcats’ attack was their ability to get contributions from a variety of players. Quinnipiac had seven players score with four of them netting two or more goals. However, senior attack Foster Cuomo is the player who made the most impact. After Cuomo and all the seniors missed the first five games of the season for disciplinary reasons, Cuomo’s return has given new life to the Bobcats as he scored three goals on Saturday and is second on the team with 13 goals. The Bonnies didn’t quit as they scored four goals in the second half to cut it to a 12-7 lead. Freshman attack Jackson Rose and midfielder Cian Collins had two goals each, but it wasn’t enough to stop the Bobcats’ offense. In total, the Bobcats finished the game with 64 shots and 33 shots on goal. However, they only scored 12 goals, which is something Poli wants his team to fix. 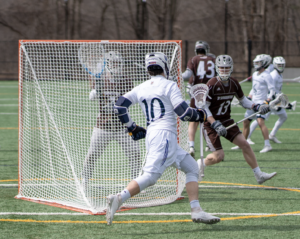 Quinnipiac will shift focus to next Saturday, March 30, as it takes on the Siena Saints, who currently sit at the top of the MAAC, at 3 p.m. in Loudonville, New York. Fletcher believes the Bobcats have to convert on more chances to come out with a favorable result.